At the end of each season, the Touchdown Club honors one of the players with the “Bob Commings Memorial Hardnose Award.” That player would have received the most votes from among weekly tallies taken by the club members. Past players honored include John Mulbach (Ohio State), David Whitfield (Ohio State), Chris Spielman (Ohio State), Shawn Crable (Michigan) and Brian Gamble (Illinois/Ashland). 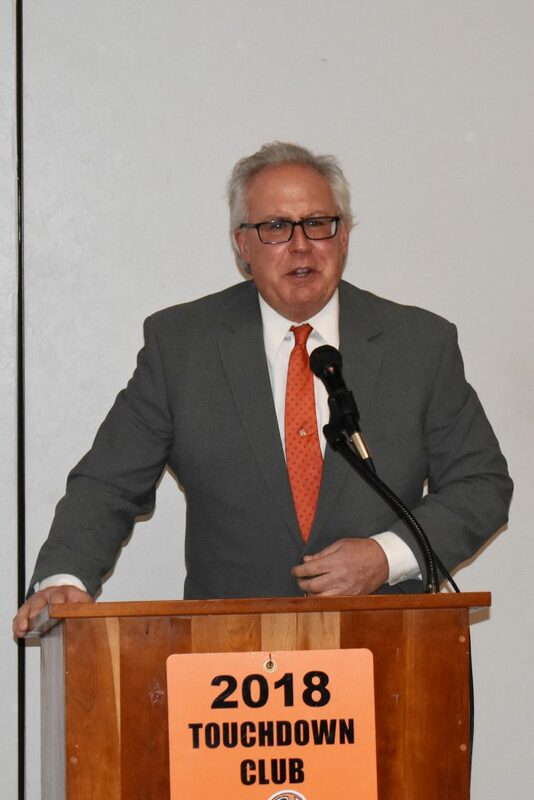 Bob Commings was a very successful coach for the Tigers from 1969 to 1973, compiling a record of 43-6-2, including Massillon’s last state championship (1970) and qualification for Ohio’s first ever state playoff games (1972). Commings departed following the 1973 season to become head coach of the University of Iowa and later coached at GlenOak High School, for which their field was later named. 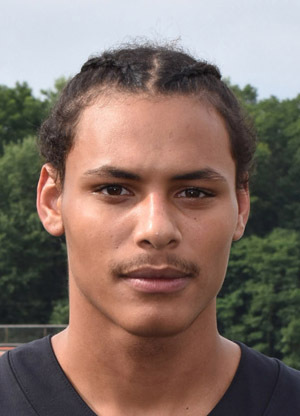 This year’s hardnose award winner was Jamir Thomas, the record-setting running back that led his team to a 14-1 record and runner-up finish in the state tournament. 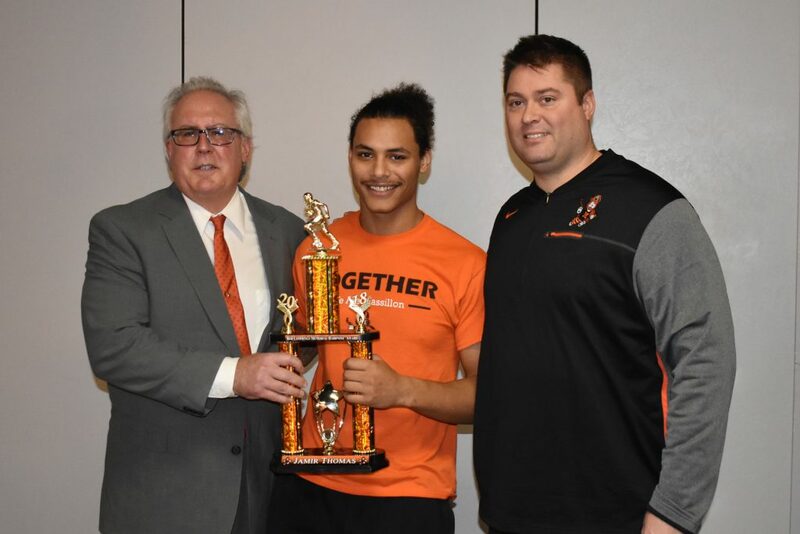 A repeat winner from last year, Jamir received the award from Bob Commings, Jr., son of the coach for which the accolade is named. 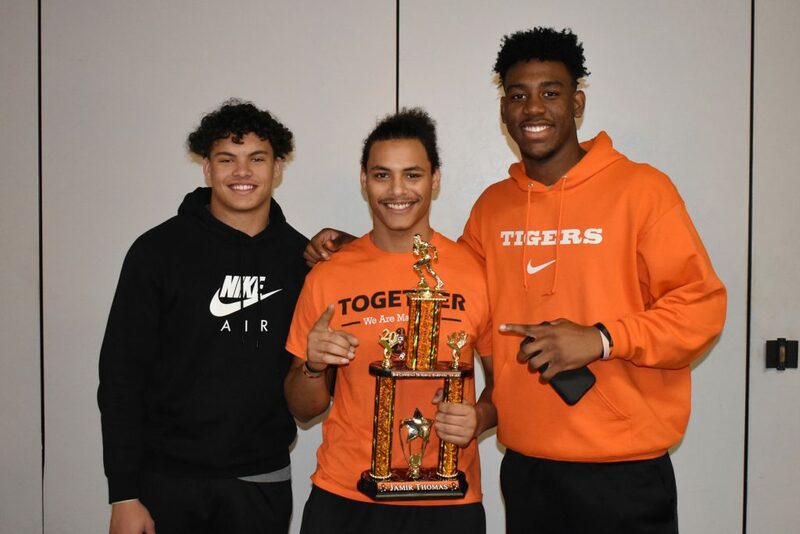 Thomas holds several Massillon career records, including rushing attempts, rushing yards, rushing touchdowns, all-purpose yards, points scored and total touchdowns. This year he rushed 261 times for 1,918 yards (7.3 yards per carry) and scored 24 touchdowns. He also played a little defense! Congratulations to Jamir Thomas. Enjoy the photos of the event. 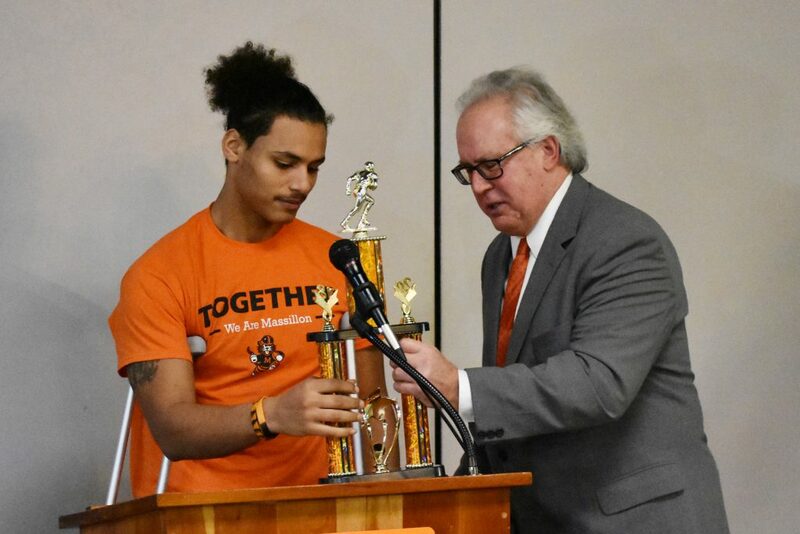 Jamir Thomas receives the 2018 Hardnose Award from Bob Commings, Jr.
Dean Clark, 2018 Hardnose Award winner Jamir Thomas and Tre’von Morgan. 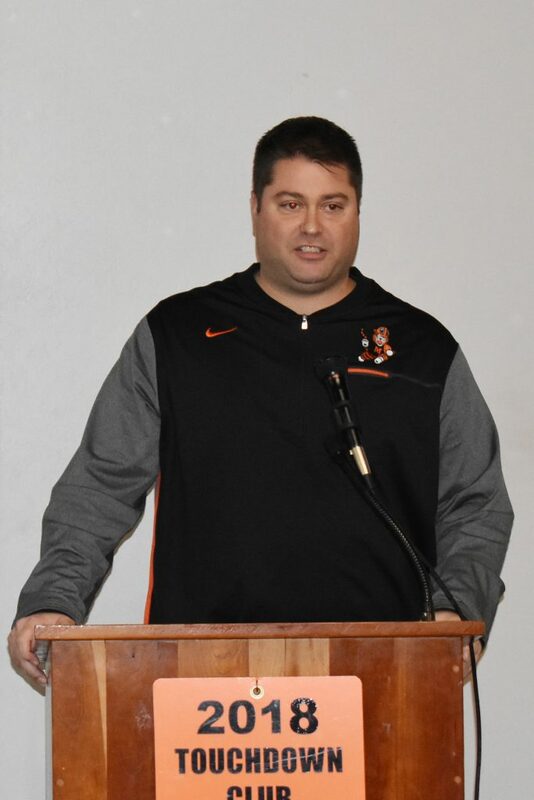 Massillon Head Coach Nate Moore speaks to the Touchdown Club. 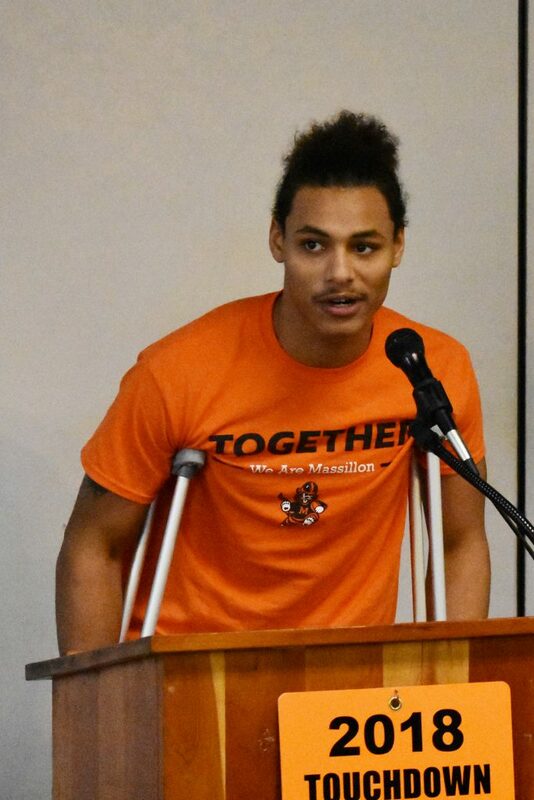 Jamir Thomas delivers his Hardnose Award acceptance speech.